Simple machines help people do work.. Thank you for taking part in the recent Student Led Conferences. The children were very excited to share their learning. 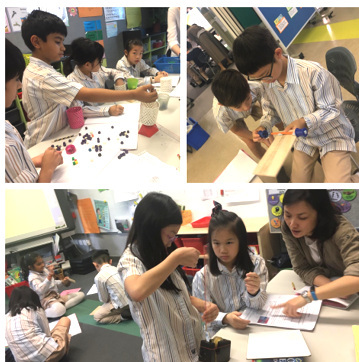 The focus for the past two weeks have been carrying out science investigations and ‘tinkering’ to construct simple machines and applying our scientific knowledge of the 3 Laws of Motion. 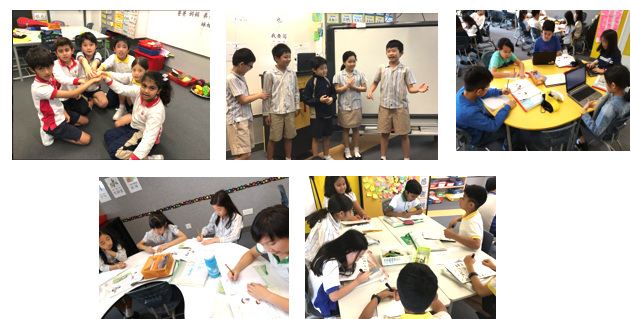 These activities have given the students the opportunity to understand HOW simple machines make work easier and to develop their skills of formulating questions eg ‘What happens if I make the inclined plane steeper’? ‘Will it require more or less energy to move the load?’ They have also deepened their scientific knowledge to help them understand that there is a relationship between the strength of a force and its effect on an object, and that friction causes changes in the speed or direction of an object’s motion. The students have enjoyed watching Rube Goldberg videos showing sophisticated chain reaction machines created to carry out simple tasks such as ‘ringing a bell’ or ‘popping a balloon’. Some students have been inspired and created their own chain reaction machines using simple machines. Please take a look at these from Roark and Khloe from 4K. The students have continued to develop their explanation writing skills. Using a co-created checklist for the language features of an explanation, the students have self assessed their own writing and set themselves ‘next steps’. Students may well have shared these writing targets with you at the Student Led Conferences held earlier this week. In order to develop the quality of the questions being asked, we have inquired into different types of questions – ‘Thick or Thin’? In some classes students have had the opportunity of ‘hot seating’ to ask thick and thin questions of classmates and teachers. It is a really exciting way of getting to know each other better and a way of developing relationships within the classroom community. The focus on the strands of measurement and data handling has continued over the last two weeks. 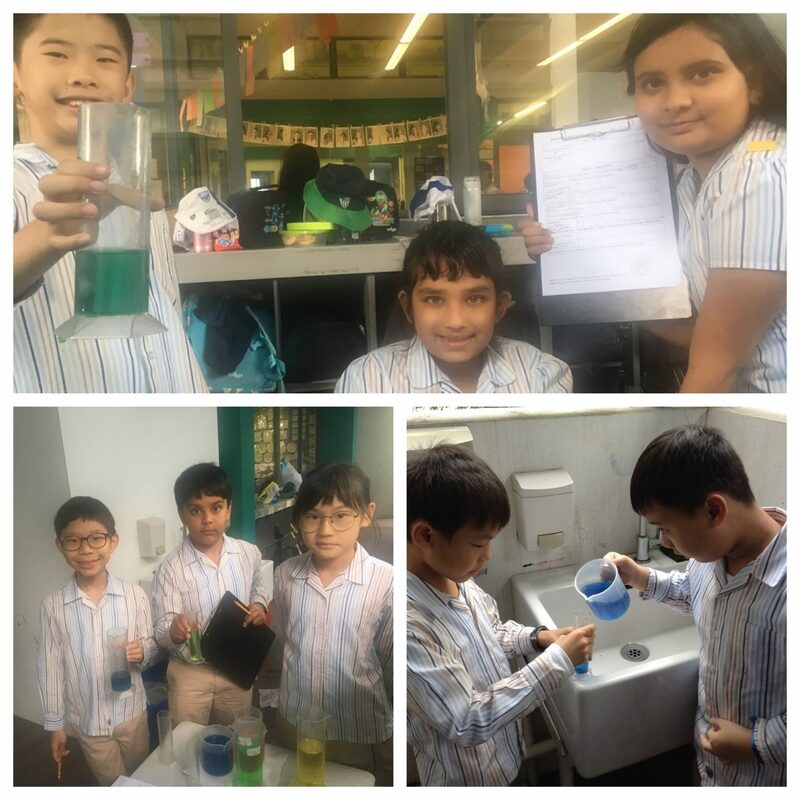 The students have been developing their measuring skills of length, width, mass, capacity, and volume when taking part in collaborative inquiry tasks including designing a space cocktail and creating playdoh balls to a specified mass. The ability to read scales accurately has been essential and those students who bake at home regularly have been able to share their expertise! Our year long ‘Who We Are’ well-being unit has been used as a transdisciplinary opportunity for data handling. Our third line of inquiry: ‘Maintaining positive wellbeing (responsibility)’ has been the aim for collecting student voice on the layout of the Y4 classrooms and shared area.Using the Thinking Routine ‘Parts, Purposes and Connections’,the students have inquired into possible classroom designs in order to maintain positive wellbeing. Different groups worked on different parts of the classroom and data was collected so that everyone had a voice on how the new layouts could look. We look forward to working in our new designs and have delighted in the excitement of the students – watch out they may want to re-design your home too!